I'm continuing to explore the worlds of those New Orleans gals this week with the delightfully named Klicky Robinson whose only release this Mode 45 would appear to be. 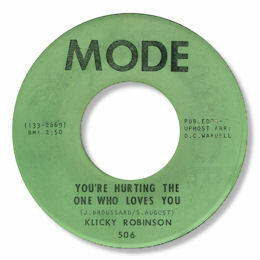 You're Hurting The One Who Loves You is a really strong waltz time ballad with a haunting melody, some emotional vocals from Klicky and - it hardly needs to be said - a first class arrangement and production from the great Wardell Quezergue. Love the piano playing and the subdued horns as well. The funky flip is pretty good too. A very worthwhile double sider. "Klicky Robinson (Mary Elizabeth Cunningham) hailed from Layetteville, North Carolina where she was born in 1944. In a music and acting career she sung with Ike Turner and Duke Ellington and appeared on stage and in films that included 'Slaves' & 'Kojak'. Around 1964 the Ikettes cut a record for Wardell Quezergue (presumably as the Fabuletts) with Klicky on lead. She followed this with the solo outing mentioned on this page. She regularly performed in New York and New Orleans' jazz clubs until 1979 when she moved back to her home town to care for her ailing mother. She died 5 May 2001." Great info as ever Greg - but what sad news about Klicky's passing. 1. My great friend Greg Burgess has spotted certain vocal similarities between Klicky's voice and the lead singer of the Fabuletts whom you can listen to here. He may well be right in thinking that Klicky was the group's lead singer. Can anybody confirm? 2. "When I wanna see you" can be found on the Funky Delicacies CD "Wardell's Sixty Smokin' Soul Senders" - but remember that good sound quality is the last thing to expect with CDs from this source.